No visite los puntos de referencia de Londres y escuche los comentarios que no le interesen. Establezca su propio itinerario y explore Londres a su manera en un tour privado de 3.5 o 6.5 horas por la capital de Inglaterra. Marque todas las atracciones en su lista de verificación personal y aproveche la visión local de su guía privado visitando gemas ocultas y rincones desconocidos de la ciudad. Elija la hora de inicio y el punto de reunión de su recorrido y reciba toda la atención de su guía en todo momento. Elija enfocar su recorrido en cualquier cosa, desde arte y arquitectura hasta moda y comida. Ideal para familias y pequeños grupos de viajeros. Vea las dos atracciones icónicas y los rincones escondidos de la ciudad capital. Después de reservar su tour, recibirá un breve correo electrónico con un cuestionario que le pedirá que indique qué áreas de la ciudad desea explorar. Luego, en el día de su recorrido, salude a su guía a la hora que mejor se adapte a su horario y embarque en su recorrido personalizado desde su hotel. En el transcurso de 3.5 o 6.5 horas, experimentará un recorrido completo del lado elegido de la ciudad. Si estás interesado en la arquitectura, tu guía te llevará a edificios innovadores y monumentos clásicos. Los amantes de la literatura pueden explorar Bloomsbury y la Biblioteca Británica; Los entusiastas de la historia pueden visitar algunos de los monumentos más antiguos de Londres; y los aficionados al teatro pueden ver las brillantes luces de Covent Garden y Leicester Square. Sea cual sea la forma que elija para pasar su tiempo, está seguro de que recibirá una atención indivisa por parte de su guía privado. Su recorrido concluye en un lugar de su elección. I highly recommend this custom tour to everyone. I was limited on time, so I booked this so I could pack as much as possible into one day, They send you a survey within an hour of booking. You can choose to pack your day full of things or go slow and enjoy the highlights. The best thing about a private tour is it is customized around what you like. I'm a huge Harry Potter fan, so my guide Ollie showed me all the filming locations. I also got to see the changing of the guards at Buckingham Palace, which was one of the highlights of my day. I learned so much about the history of London and about the great fire of London. The morning of our booked tour, my husband woke up with an inflamed, very painful area in front of his ear. We knew he needed medical help. So when our guide arrived, we asked for his advice. This wonderful young man, Gio, not only guided us through the National Health Service System, he stayed with us and spent extra time until my husband had received a diagnosis and medication. Gio was so kind and compassionate, and went above and beyond. He offered to reschedule, agreed to get us to the urgent car, spent hours talking with us while we waited. It turns out we learned a lot about London just sitting and talking. Gio was very, very knowledgeable, articulate, and funny. He got us through what could have been an extremely bad experience with good humor and kindness. Then he insisted on escorting us to our next activity, even though it was well beyond our allotted time. Gio was the most amazing young man, and we will never forget his kindness and his extremely good tour of London! Gio was an outstanding tour guide. We visited many outstanding London sites including the changing of the guard at Buckingham Palace. We also got to use the Tube and buses to get to different areas. The tour ended at Tower Bridge where we had a great lunch at a restaurant recommended by Gio. What a view! A terrific tour by all accounts. Could not be more pleased with Gio. What a gentleman! Learned so much about London from a polite and engaged tour guide! Rained on our tour day but that did nothing to slow us down! Will do this again to learn more about the great city of London! We had a great day exploring London on our Private Tour with our guide Gio. He was filled with so much knowledge and gave us so much history of old and new London. He also helped us with navigating around the city and emailed me after the tour with more suggestions and advice. We only had one day to see London and as this was our first time, decided to book this day tour in order to go to all the places we wanted to see. Our guide was the wonderful and fantastic Gio. What a wonderful experience he made this day for us. He took us to all the highlights that we wanted to see and was very friendly and knowledgeable. He met us at our hotel, and from there we began our day with fun and laughter. We had never been to London before, and not knowing how to get around, could never have seen all the things we did without him. He was extremely pleasant and well organised and made sure to take plenty of photos of us at all the highlights. A BIG thank you Gio. You made our only free day in London really special and memorable. We look forward to meeting up with you again some day on our next visit there. Our first full day in London was rainy and a bit chilly... and we were doing a walking tour. It was AWESOME! Ed our tour guide was top notch, very personable and quite knowledgeable. Thanks Ed for making our trip to London memorable!!! The blotted cream is now one of our favs!!!! We'll need to hit Borough Market one more time before we leave :. Thanks again. Booking on line with Viator was a very easy process and everything went well for our tour. 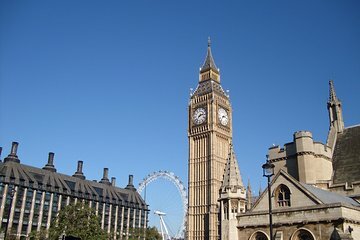 We were contacted in advance by Geo with Private London Tours who reviewed our interests and customized our tour for us. He communicated with us and provided the exact location to meet including photos to recognize the land marks, and his cell phone for any questions. Our primary interest was to see the Changing of the Guard ceremony. He was able to take us to a less crowded location to see the guards up close and even take pictures standing next to them. And he also took photos for us of our group. We also saw most of the sites we had listed on our 'areas of interest survey' including Westminster Abbey, Buckingham Palace and the beautiful parks surrounding the palace, Big Ben, Houses of Parliament, Trafalgar Square, Tower of London, the Shard, Tower Bridge, London Bridge, Monument to the Great Fire of London, and much more!! Although there was not enough time to go into the sites, Gio was very knowledgeable and informative telling us a great deal about each one. He also had a wonderful sense of humor which made our tour not only interesting but also fun. We really learned a lot about British history! Since our time was limited in London, we are so glad we chose a private tour that could be individualized for us and highly recommend this experience! Our February 2018 private tour of London was spectacular! Gio planned our day with such care, hitting all of our must-see locations. The highlight of the trip was the perfectly timed viewing of the changing of the horse guard with a surprise peak at the Queen's motorcade! At the conclusion of our tour, Gio followed up with an email giving us detailed suggestions, directions for the remainder of our trip. We couldn't have been more pleased with our London tour!